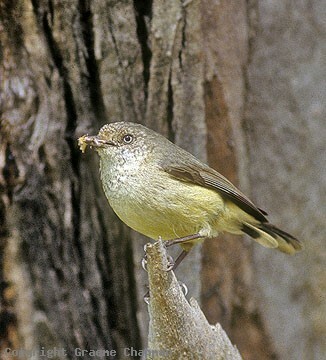 Buff-rumped Thornbills are found in the drier, more open forest regions of coastal eastern Australia. 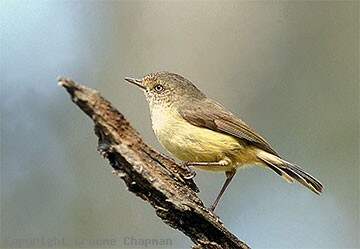 Further inland they are replaced by the Chestnut-rumped Thornbill and in SW W.A. the Western Thornbill is another near relative. All three species forage mainly on the ground and live in family parties. 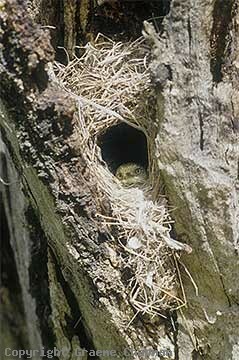 Buff-rumped Thornbills usually nest close to the ground, in a tussock , under the bark of a tree or in a hollow. The female alone incubates the eggs, but all members of a group share in feeding the young. In winter, groups may aggregate with other species into mixed feeding flocks. Apart from the buff-coloured rump the other key field mark is the pale coloured eye. 484201 ... Buff-rumped Thornbill sitting in nest. 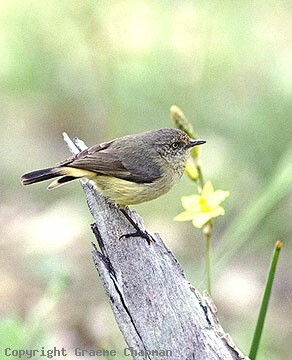 484202 ... Buff-rumped Thornbill, Canberra, A.C.T. 484205 ... A key field mark is the pale-coloured eye.